← 49 days to Japan! 45 days to Japan: Gratitude! A while back I mentioned that I’d ordered “What I Talk About When I Talk About Running” by Haruki Marakami. Well the book arrived and I finished it a while ago. I totally recommend it even if you aren’t interested in running or writing. Anyway, today I want to talk about a point that Marakami makes in the book. He talks about how his wife is the type of person who can eat anything and put on weight while he is the opposite. I’m totally paraphrasing here (I could go get the book but it’s on the other side of the room), but he talks about realising the good side of this: that it’s his body’s early warning that he’s doing the wrong things. That takes a bit of mulling over, being grateful for putting on weight. I mean, personally I’d love nothing better than to have one of those super speedy metabolisms. I’d love to chow down on a whole tiramisu for breakfast without porking up. But I can see where he’s coming from. The ultimate damage ÍSN’T getting fat, the real damage is what we do to our inside. If we can see we’re getting fat and change our habits then we stop the far greater risks – diabetes, heart disease and all those other yummy things. Yah for fat, you serve a purpose! Thinking on this, there are some other things I’m reluctantly grateful for like the niggles that I get when running that tell me to pull back and prevent more serious injuries and (very, very reluctantly) the migraines I get when I’m overtired that force me into having a rest. Short of having a perfect body keeps on going like the Energeriser Bunny, these things are my bodies way of getting the response it needs. Even food binges, while horrible things that wreck my carefully laid plans, are a response, a cry for help from some emotional place that isn’t getting what it needs. Our bodies and minds are wonderful things that demand we listen up, aren’t they! Speaking of needs, I got some good news today. I’ll try to make this as simple and unconvoluted as I can. Most of this year I’ve been contracting for Agency A. At the moment, I’m doing a contract with Agency B for a company I worked for last year. My contract was supposed to end last week and I’d told Agency A that. They said they’d find me more work. In the meantime, my current contract got extended for another 2 weeks. I’d not told Agency A but they hadn’t rang me at all so I figured they had nothing for me. Today I rang Agency A to let them know I’d be available after next week. My agent said that two of the companies I’d worked for before both want me back but one is still seeking budget approval and the other one has the contact person on holidays this week. Just hearing this, I felt like a huge weight had been lifted from me. Even though I’d not been fully conscious of it, the thought of not working for the next 5 weeks had really been getting me down. I think I’d be fine to cover the time off work and have enough put aside for my holiday but I’d have to get home from hols with no money to live on. So anyway, to celebrate I went out today and went on an accessory binge. OMG, I only went in the shop down the street for a quick look. 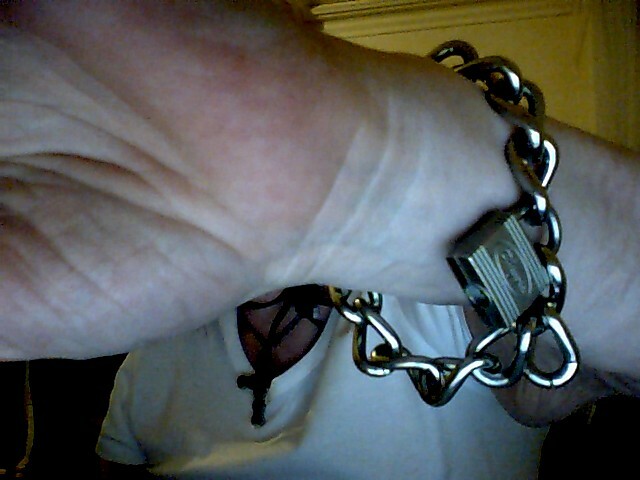 I ended up with a leopard wrist cuff and a big chunky chain with a padlock. Ignore the jiggly arm fat in the background! 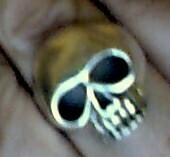 Then I realised I knew exactly where to buy the kind of skull ring I’ve wanted for ages – Charlie Weaver on Chapel St.
Then I couldn’t resist this awesome black cross with red roses. It’s awesome. I fail at saving money but I win at awesome. 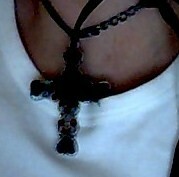 Oh the pics are crap quality cos I had to take them with my webcam. Oh I also have new hair but I have no photo of that. Glad to hear the good news on the work front! Great post – it’s so easy to get caught up in the asthetics and forget all the inside-stuff. Shallow creatures, us humans are! I have four books on the go at the moment, but the Marakami is next on the list. Just found your blog and this post was exactly what I needed to read. I have a chronic back problem that always flares up when something is not quite right in my life. Lately it has been f’ing killing me, even though I thought I’d been doing the right things. I know this is a reason to reflect on what’s going on in my life, and your post has given me a push to actually do that.